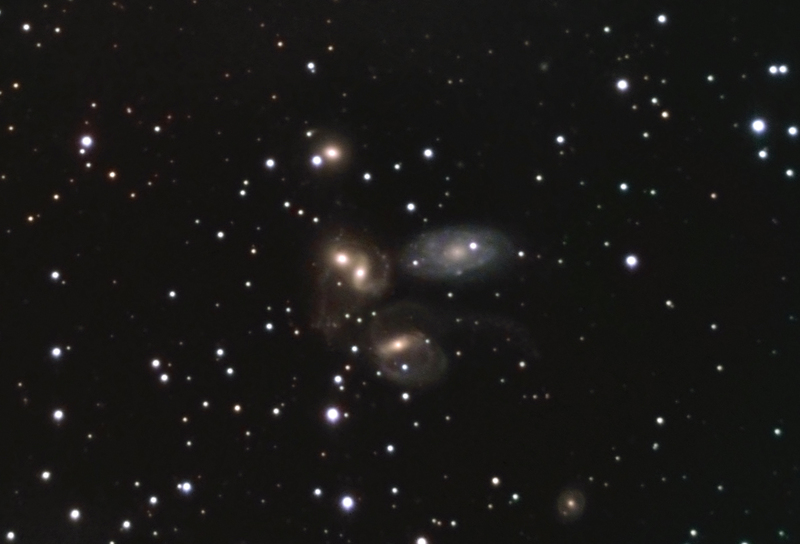 There are six galaxies plainly visible in this image, ranging in brightness from the very faint NGC7318A (magnitude 13.1) to the extremely faint NGC7320C (magnitude 16.57); the five in the middle are commonly known as Stephan's Quintet. Four of those galaxies show essentially the same redshift, suggesting that they are at the same distance from us, approximately 270 million light years. The larger bluish spiral above and right of center of the group, NGC7320, has a much smaller redshift than the others, suggesting that it is much closer to us than the others, probably a foreground object which happens to lie along the line of sight to the more distant galaxies, about 35 million light years away from us. Of the four distant galaxies in the group, three seem to be colliding, showing serious distortions due to gravitational tidal forces. 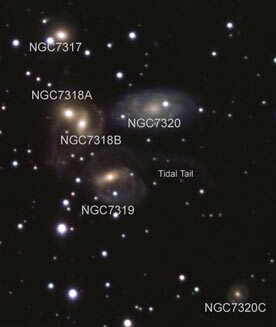 The fourth, NGC7317, above the others, is a normal appearing elliptical galaxy. Another collision that wreaked havoc was triggered by a galaxy that is no longer part of the group. NGC 7320C, at the bottom of the image, plowed through the quintet several hundred million years ago, pulling out the 100,000 light-year-long tidal tail of gaseous debris from NGC 7319 and adding gaseous fuel to the northern starburst region. NGC 7320C is now 460,000 light-years away from the rest of the carnage. The clusters in NGC 7319's streaming tail are 10 million to 500 million years old and may have formed at the time of the collision. LRGB: 380:60:60:90; L consisted of nineteen 20-minute unbinned images; R and G consisted of three 20-minute binned images; B consisted of three 30-minute binned images. Equipment: 10" LX200 at f/12, and an SBIG ST-8XE camera/CFW-8 color filter wheel, guided with an SBIG AO-7, guiding at 8 Hz in Lum, .5-3 Hz in RGB. Image Acquisition/Camera Control: CCDSoft V5. Processing: All data calibrated (darks and dawn flats/flat darks) and registered in CCDSoft. Luminance layer average combined in Sigma; RGB average combined in CCDSoft. Luminance layer had one iteration of fast Richardson-Lucy, followed by ten iterations of slow R-L, applied in AIP4WIN; color combine, curves, levels and gaussian blurs applied in Photoshop. Location: My yard in Redmond, Washington, elevation 500'. Date: Luminance images taken during the nights of 9/20/03 and 9/28/03; color images taken during the night of 9/27/03. Moon Phase: Taken around a new moon; no moon while imaging. Seeing: Variable, with individual images varying from 2.0 arcsecond to 2.5 arcsecond FWHM on single calibrated images; average of perhaps 2.2 arcsecond FWHM. Deconvolved to 1.9 arcsecond FWHM.